Are you weary, wounded, or worried? Does grief weigh heavy? Do burdens feel too great to bear? Then you are perfectly positioned for a miraculous move of God. Haven’t you struggled long enough? God is waiting with open arms for you to let go and be overtaken by His grace. He is inviting you on the undertaking of a lifetime. His invitation is for a deeper, more love-infused walk than you can imagine. In whatever trials you find yourself, God is right beside you, His Holy Spirit alive within you. He knows how much you hurt, He sees your tears and knows your fears. Then His Word whispers, “Don’t be afraid, for I am with you.” Isaiah 41:10, NLT. Overtaken by Grace is a beautifully written portrayal of the very nature of God. With honesty and transparency, Debbie Milam shares personal experiences that lead the reader to hunger and thirst for an intimate relationship with God. She puts a handle on God’s promises and leads readers to apply them in their lives. Overtaken by Grace is both refreshing and challenging, a must-read for anyone struggling to find hope and light in the midst of despair and darkness. An added bonus is the Bible study for each chapter, making this book a perfect tool for small groups as well as personal study. An incredible reading experience. 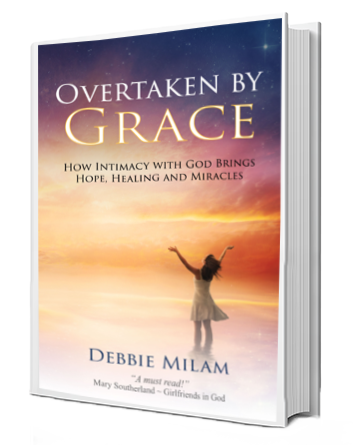 Debbie Milam takes you on personal journey embracing God’s presence in the midst of challenges, uncertainty, and the moments that create complete havoc in your life. No matter what you are facing, Overtaken by Grace will encourage you and infuse soul-soothing insight. And through every carefully crafted thought, you will experience an endearing authenticity as Debbie’s own spiritual journey with God is revealed. 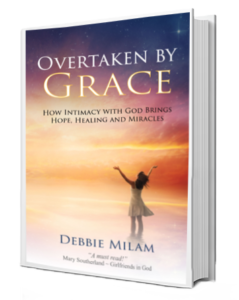 Overtaken by Grace will take your faith to deeper levels; inspire you to see every part of life as a miracle; and find strength, hope, and trust in Jesus. It is a refreshing read, using imagery that causes all of your senses to come alive in the presence of our heavenly Father. Gently inviting us to place every obstacle and pain into a view where God is at the center of it all, ready to carry us through the darkest moments of our life into His glorious light. Debbie Milam has a heart that is Christ-centered and Kingdom-focused. Her words are insightful and uplifting to all who read them. I know that you will be inspired, encouraged, and challenged just as I have by this book. May God bless you in this reading. Overtaken by Grace is an intimate adventure with God that will refresh your soul as it reveals how God’s promises bring comfort, peace and healing throughout every season of our lives. What an incredible book. 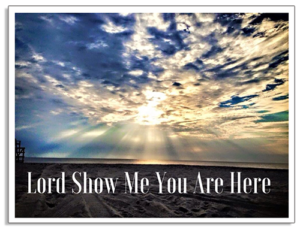 Lord Show Me You Are Here is a visual retreat depicting how God epically shows up and off. A gift book filled with prayers, inspiration and heaven sent photography created as a refuge to experience the magnificent power, beauty and love of God. Click the button below to order your copy of Lord Show Me You are Here.